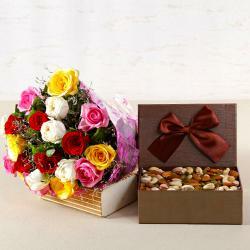 Product Consists: Bouquet of 12 Red Color Roses along with Half kg Chocolate Cake and Teddy Bear (6 inches). Just Because your sweetheart deserves some this extraordinary we bring you elegant hamper of cake with red roses and teddy bear. This chocolate cake is a sweet and delicious treat. Teddy Bear Combine with a bouquet of dozen red roses with lots of fillers in a cellophane packing finished with a ribbon and make it an ideal gift. 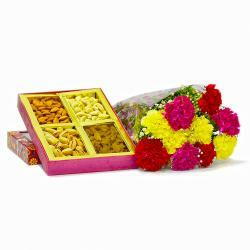 This gift is suitable for occasion such as Birthdays, Anniversaries and Weddings, Engagement, Good Luck Gifts, Get Well Soon, Dhanteras, Eid and many more. 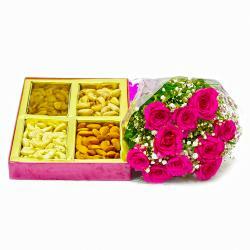 Gifting is a way to let the person know that you care and that you are happy because it is his or her gift hamper contains : Bouquet of 12 Red Color Roses along with Half kg Chocolate Cake and Teddy Bear (6 inches).